Thailand's Thitiphun Chuayprakong produced a bogey-free round of five-under-par 66 to soar into the lead after the halfway stage of the $300,000 Bashundhara Bangladesh Open at the Kurmitola Golf Club here in Dhaka on Thursday. The 23-year-old Thai, who opened his campaign with a 65, highlighted his round with five birdies to grab a two-shot lead over South Korea's Soomin Lee with a total of 11-under 131. Overnight co-leader Lee settled for second place following a 69. The Indian trio of Chikkarangappa S. (66), Shubhankar Sharma (68) and five-time Asian Tour winner Gaganjeet Bhullar (67) took the joint third place on 134 along with Scott Vincent of Zimbabwe (66) and Sutijet Kooratanapisan (67) of Thailand. Mohammad Abdul Matin and Shakhawat Sohel were at the joint 10th position with identical totals of 136 to emerge as the highest placed local players. Matin and Sohel had rounds of 68 and 66 respectively. A total of 70 players made the halfway cut which was set at one-over 143. Thitiphun, who is searching for his first Asian Tour title, was delighted to rediscover some of his best form as he negotiated the course with only 25 putts. His highlights of the day came on the par-three sixth hole where he sank a 30-footer birdie putt and on the 11th where he chipped in for birdie from 60 feet. "I am feeling very excited to be on top of the leaderboard now. I have played well for a long time but I still feel comfortable with my game. Hopefully I can stay this week till the end of the week. "I will just keep doing the same for the next two rounds. I will try not to think too much about my scores. 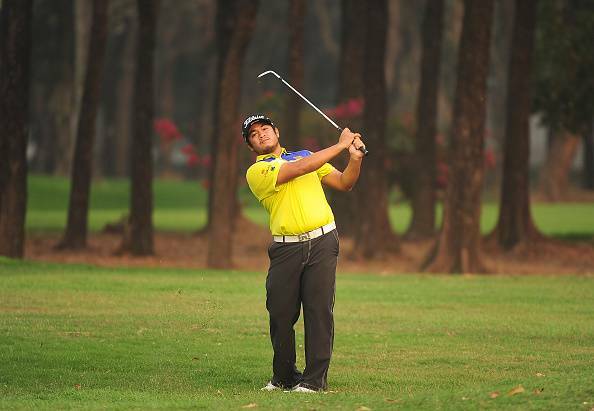 I will stick to my game plan and try to do my best out there," Thitiphun said after his round. Lee was disappointed not to emulate his opening round magic but took it in his stride as he is still in a favourable position heading into the next two rounds. "I started from the 10 and made my first birdie of the day on 12 where I sank a 25-footer putt. That got my game going. I told myself to keep trying to hit good shots like how I did yesterday but it didn't happen which was disappointing. Overall, my game was good although my iron-play wasn't as sharp as yesterday," he said. Chikkarangappa had a slow start, nailing only one birdie against eight pars on the front nine. He dropped a shot on the 10th, but bounced back gallantly with a birdie-birdie-eagle starting from 12 before closing with a 25-footer birdie putt on the 18th. "I played alright on the front nine. I stumbled with a bogey on 10 and I didn't hit a good drive on 11 but the turning point came on the 12. I holed a 15-footer for birdie and made a second straight birdie on 13 before chipping in for eagle from just off the green on 14," Chikkarangappa said. "I am just going to stick to my game for the next two rounds. I have been in contention before and I just want to stick through it. It's all about being patient, staying calm and relax. I just want to enjoy myself out there," the 22-year-old added.